An introduction to philosophy of language through systematic and accessible explanations of ten classic texts by such thinkers as Frege, Kripke, Russell, and Putnam. Many beginning students in philosophy of language find themselves grappling with dense and difficult texts not easily understood by someone new to the field. 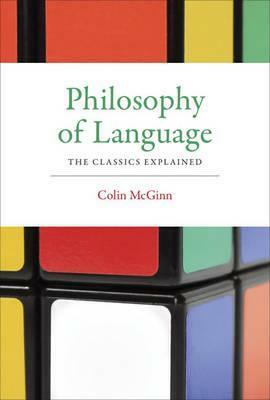 This book offers an introduction to philosophy of language by explaining ten classic, often anthologized, texts. Accessible and thorough, written with a unique combination of informality and careful formulation, the book addresses sense and reference, proper names, definite descriptions, indexicals, the definition of truth, truth and meaning, and the nature of speaker meaning, as addressed by Frege, Kripke, Russell, Donnellan, Kaplan, Evans, Putnam, Tarski, Davidson, and Grice. The explanations aim to be as simple as possible without sacrificing accuracy; critical assessments are included with the exposition in order to stimulate further thought and discussion. Philosophy of Language will be an essential resource for undergraduates in a typical philosophy of language course or for graduate students with no background in the field. It can be used in conjunction with an anthology of classic texts, sparing the instructor much arduous exegesis. Colin McGinn has taught philosophy at institutions of higher learning including University College London, Rutgers University, and Oxford University. He is the author of The Character of Mind, Consciousness and Its Objects, The Meaning of Disgust, and other books.